Tried and true, our all-season cotton crew work sock delivers all-day comfort in a wide range of conditions. 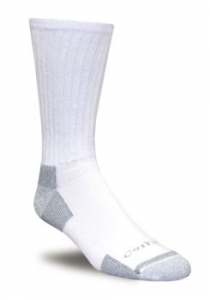 Offered in a crew length, this midweight sock comes in a durable blend of 73% cotton, 17% nylon, 9% polyester and 1% lycra-spandex. Mesh cooling channels for better breathability. Cushioned foot for comfort.